Stitch markers are one of those things you don’t realize you’re missing until you need them for a knitting (or crochet) project and such is the case with me. Whether you are knitting something with several increases or decreases, marking where you need to make a colour change in Fair Isle, or keeping track of the number of stitches on your needle (ideal for a shawl), stitch markers are very helpful. A friend who makes her own inspired me to consider making them too, so I gave it a try. She recommended buying an on-sale charm bracelet and working with those charms since they would already have the built-in loops. 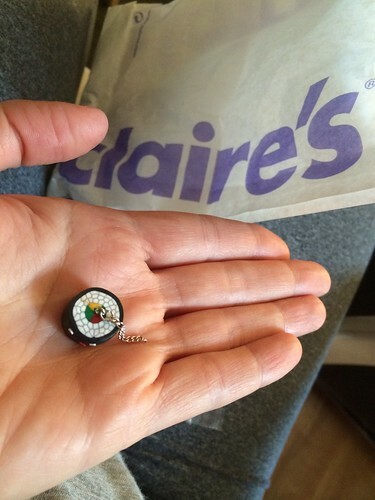 I had just such luck at Claire’s in finding a trio of sushi charms on a cheap chain necklace for €3. That breaks down to €1 per charm. 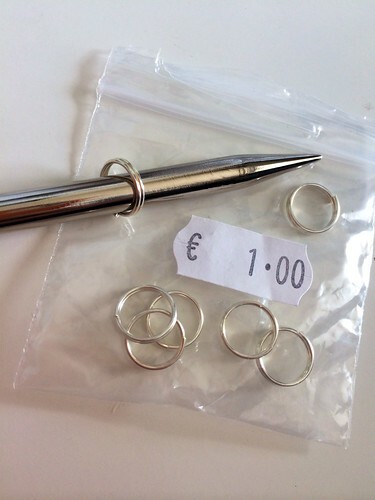 Then I bought a €1 bag of mini wind-on rings at the local craft store. The necklace is like any other so I’m posting a photo of the wind-on rings since they are more unique. These rings might be problematic for lace weight knitting because the wind-on feature may catch, but I’m using the for DK and Aran weight so it should be ok.
First, I set about removing the cheap chain the sushi came on. Then I slipped the wind-on loop onto the jump ring. I could also have wound it on, but wanted to see how this approach would work. And it did. 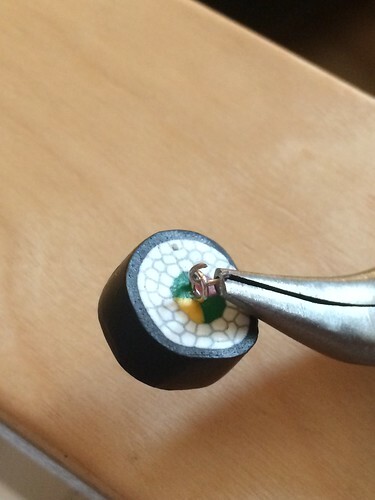 I also put one drop of superglue where the metal meets the sushi to make sure they stay stuck. Then I closed the jump ring properly. The process worked nicely. 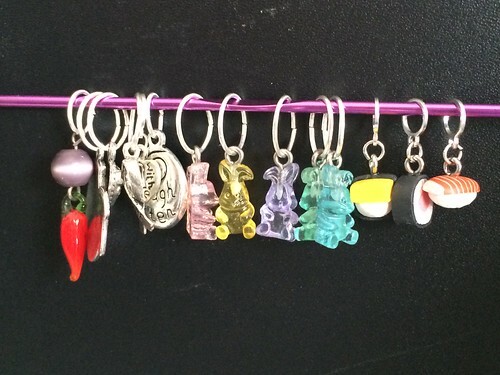 I ended up with a trio of stitch markers that work on knitting needles suitable for up to Aran weight yarn. Ta-da! This entry was posted in Jewellery | Beadwork, Knitting | Crochet, Knitting Gifts & Supplies, Tutorials | Patterns and tagged stitch markers. Coolest project! Gotta make some of these. Amazingly easy once you get the hang of the process. 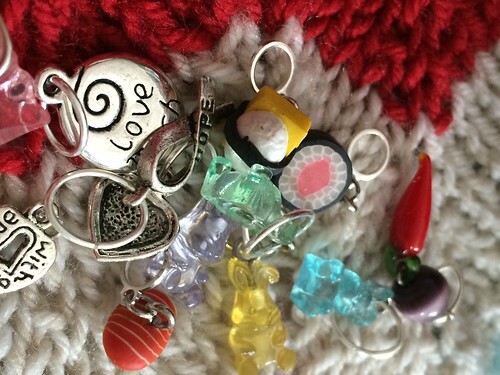 The key is to find inexpensive charms. 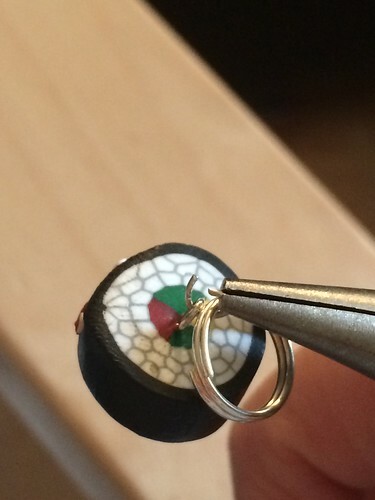 I think I’ll be looking at wine glass charms on sale next. 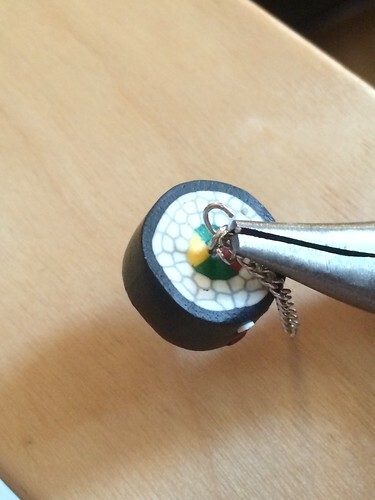 But modelling clay sushi was just too cute to resist, Laura. 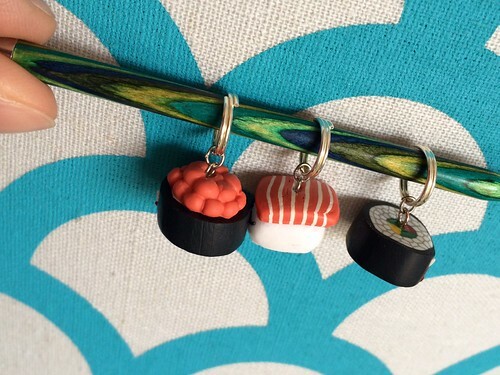 What a great idea for finding cute charms.